Bolton loanee Jay Spearing "still has Liverpool future"
Jay Spearing believes he still has a future at Liverpool, despite joining relegated Bolton on a season-long loan. The 23-year-old midfielder had not featured in the Premier League under new Reds boss Brendan Rodgers before moving to the Reebok Stadium on Friday. Spearing told BBC Radio Manchester: "We had a really good chat about how we thought the season was going to go. "We both decided that it would be good for me to go out, get some experience and play some football." 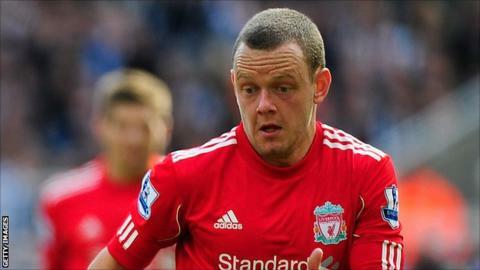 When asked if he felt he could make an impact on his return to Anfield, Spearing added: "I don't see why not, but at the moment I'm with Bolton. "I want to try and produce for Bolton and get us back into the Premier League. It's a massive club with a massive support and I really think we can do it." Spearing made his debut in a 3-1 defeat at Hull City on Saturday, a result that rounded off an indifferent start to the Championship season for Wanderers. "We started off really well and, when we got the ball down and played, I thought we were the better team," he continued. "It was just individual errors that caused us problems. We have to stop that straight away, particularly if we want to be up near the top. "Looking back, I don't think they massively put us under a lot of pressure. It was just our own mistakes."